Most commonly finished as 5.5×8.5 or 8.5×11 sizes. 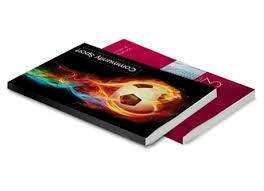 However we can customize booklets & books to fit your specifications. Saddle Stitching is the common term for folding and stapling twice along the spine for a magazine like appearance. This finish provides an inexpensive and efficient method for business materials to be printed in Color or Black & White and easily viewed as a book. Perfect Binding offers a textbook appearance with a glued spine and cut edges for a clean professional appearance. Both options are typically printed with a heavier card stock cover and gloss or matte text pages. New Square Fold Spine with face trimming, less expensive alternative to perfect binding.